43 Quintillion is named for the number of possible combinations in a Rubik's Cube. While I never understood the appeal of the Cube, I do like this polish a lot! Made of a mix of bright glitters and white and black accents, 43 Quintillion is sure to stand out. I've shown it here over American Apparel L'Esprit. Flashbang is a mix of whites, semi-opaque whites, silvers, and micro holographic glitters. The formula on this one is quite easy to work with. I found there were a ton of glitter "goodies" per swipe and I didn't have to spot fill or anything. I imagine this would look good over just about any color, light or dark, vibrant or muted. Shown over Julep Taylor. Obligatory Xmas Polish is one of my favorites that I tried out. While it functions nicely as a Christmas polish (like a decorated tree! ), this beauty has a multitude of shapes and colors in it that make it appropriate for any time of year. I'm not usually drawn to greens, but this polish has really captured my heart. I layered one coat over Essie Mojito Madness. Finally, we have Teal Me About It, which I've shown over China Glaze Escaping Reality. 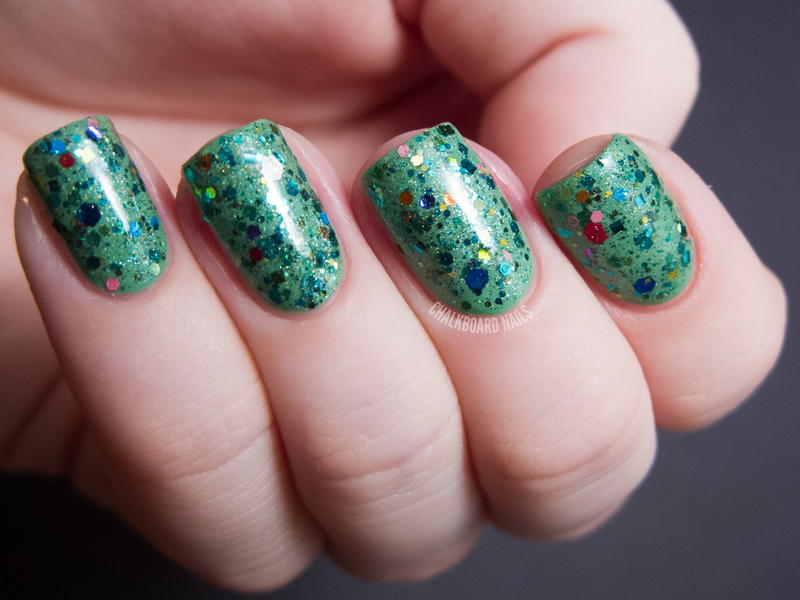 This glitter topper consists of all teal glitters in diamonds, hexes, and small hexes. I loved wearing this combination a lot and want to try putting it over more contrasting bases! Which ones are you guys liking the most? Tough As Nails Lacquer polishes can be purchased on Etsy in 7mL and 15mL sizes. Chalkboard Nails readers can receive 10% off for the next week by using the code "CHALKBOARD10" at checkout! Additionally, be sure to follow the brand on Facebook for news and more. I love Flashbang and Teal Me About it! All the glitter polishes are starting to blur together. It would be great to see some swatches of other styles of polish! 43 Quintillion has to be my favourite. Nail polish and nerdery all in one? Fantastic. great swatches!! I love Tough As Nails!! Your swatches are perfection. Gorgeous. OMG! All of these are gorgeous, but I really love the first one! Wow! Flashbang is gorgeous over that blue. Love her polish names too - clever without being cheesy. I always enjoy seeing your swatches. Your nails are beautiful! How do you get them so wonderful looking? I like Teal Me About It and 43 Quintillion. Love the swatches! 43 Quintillion and Teal Me About It are my favourite! 43 quintillion and obligatory Xmas polish is just my kind of polish.